The Google Trends tool shows it very clearly. In the past 8 years, the search for ‘adtech’, or ad tech, which shows the same trend, has steadily declined while the search for the keyword ‘marketing automation’ as risen remarkably. Ad tech is clearly on a downslide, with martech coming up strongly. Here is our assessment of this trend, and 3 reasons why this would continue. The Google Trends chart shows you the relative amount of searches over the period of time you’ve chosen. The highest point in the chart, i.e. the maximum volume of searches in that period is set at 100%. All the other data points in the chart are relative to this moment. 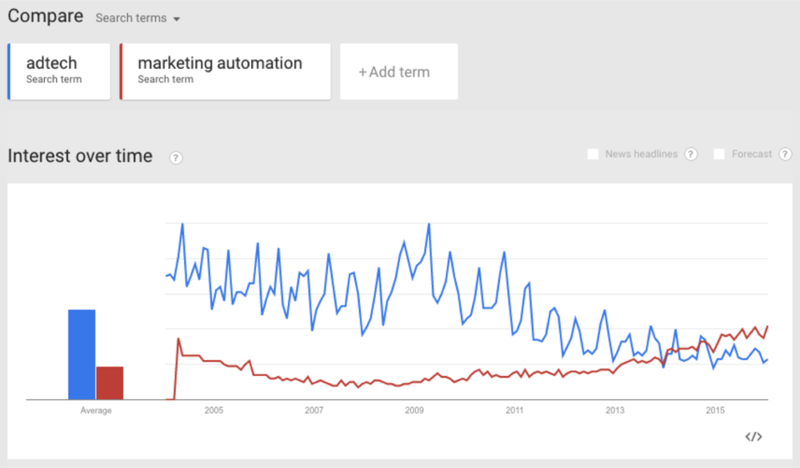 So in April 2009, adtech reached a peak in searches, with ‘marketing automation’ at that point at 11%. 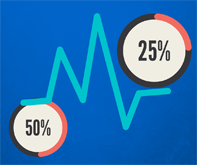 On average, adtech was searched for 50% of the time (per month) and marketing automation 18% of the time. But the trend shows adtech steadily declining with Marketing Automation overtaking adtech in June 2014, topping out in January 2016 with 43% against 23%. Has adtech had its heyday? Here are 3 reasons why we say yes. It has been said numerous times, in the world of social media, advertising is dying a slow death. We know that this not something new but it is still heavily contested by a number of advertising incumbents. In our opinion, customers lead the brand interaction and expect a personalised instant dialogue with a brand. To enable that you need nimble technology that turns data into actions that are relevant and authentic to customers. At least this is what modern marketing people will tell you and by all means we think they are right. But while some types of advertising are in decline, it still has a place as a strategy and tactic to create temporary buzz and awareness. For as long as people watch television, surf the web or roam the streets, we will have banners, billboards, pop-ups and tv-ads that are there to interrupt our attention and shove some form of a brand message into our brains. If that is what you’re after as a brand, there are still numerous agencies and an increasingly diverse range of technologies available, to serve your needs. Advertising technology is also still evolving. Programmatic buying and serving, retargeting and personalised dynamic ads are among the more recent technological developments in that space. But why then do marketers say that advertising will be replaced by marketing? The biggest driver is the online and digital environment we live in today, which now allows brands to develop and maintain a relationship with their customers. Today’s jaded and educated consumers are starting to expect this relationship. It’s becoming increasingly difficult to distinguish between marketing and PR, which are now sharing the same objective of managing and maintaining relationships through communication. The increasingly important role of marketing in the customer relationship, the analysis of customer feedback and through that the alignment of products and services to customer requirements, all cause marketing to become more demanding, specifically when it comes to technology. So that would explain why there is an increasing amount of search for marketing technology at the expense of adtech. I know that quite a few adtech companies would disagree but we would argue that advertising technology is relatively straightforward. There is still a role for strategy, specifically when it comes to programmatic. Also creative design still plays a role, because banners need to stand out somehow. But once it comes to the distribution of a campaign, it is pretty much a question of lining the media and assets up and pushing the ‘blast’ button. With a bit of luck you have KPIs in place to measure the change of brand perception and increase in sales, or the lack thereof when the campaign fails or backfires. Even programmatic is fairly simple to implement, specifically if you get the help from a reputable agency or the programmatic platform vendor themselves. With marketing the situation requires more effort. The increasingly complex interaction between customers who connect with brands and complete a buying process, which according to Facebook happens typically on 4 devices, tracking the customer, enticing him to convert to buy the product, to then ensure that data is captured to keep the relationship going, is to put it mildly, complex. Many organisations, big and small, have built marketing stacks. A stack is a collection of solutions, services and platforms, or point solutions, which together enable marketing. Stacks may enable the campaign planning, development and delivery but most stacks do not offer an integrated workflow. Data e.g. is collected in different places in the stack but hardly ever is it collected in one location to produce comprehensive reporting and dashboards. If you have customer data in one part of the process, this might not be available in another part, handled by another solution in your stack. This means that stacks on the hand make parts of the process a better experience for the customer or a more efficient process for the marketer. But managing a marketing stack as a whole and keeping track of what happens where is still complex. Yes, this is a bit of a paradox but mastering this, is the only way forward to a more holistic approach to marketing. Our viewpoint on this is that the focus in companies is shifting from advertising to marketing, or should we say to integrated advertising and marketing in the first place. In the second place, now that marketers are increasingly interested in marketing technology, they turn more and more to the web for answers. This leads to the increase in searches on Google. 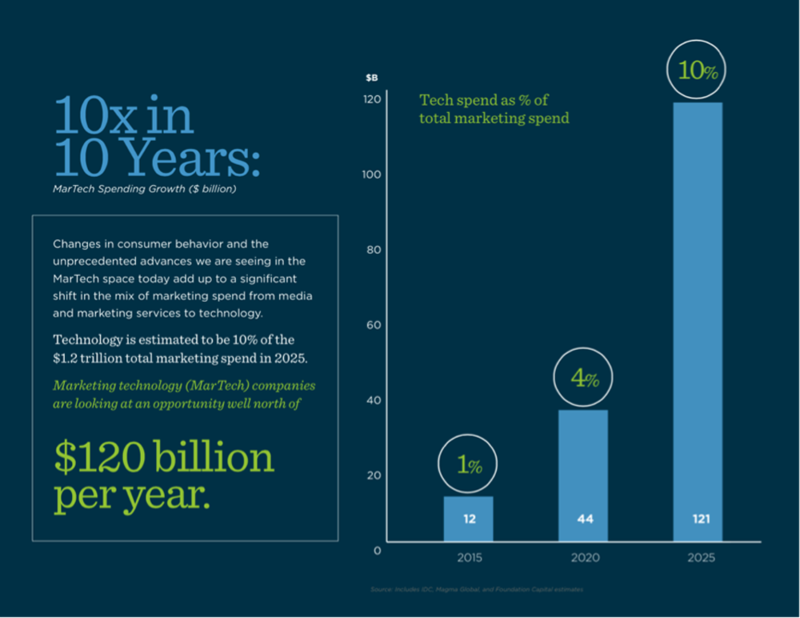 If you extrapolate the trend in marketing spending, we think that marketing technology will ultimately be bigger than advertising technology in terms of spend. Gartner predicted in 2014 that by 2017 the CMO would spend more on IT than the CIO. To this date this prediction seem to hold. According to Ashu Garg, General Partner at Foundation Capital, the shift from marketing art to marketing science will lead to more spending on technology. He predicts that CMOs will be spending 44 billion USD by 2020 and 120 billion USD by 2025. 44 billion in 2020 is equal to the 42 billion USD that Forrester expects the market size for ERP to be in 2020. 120 billion USD by 2025 is 3x times that revenue. The difference between the two however is that marketing technology only became a topic in the past 5 years, where as ERP has been one of the first major platforms companies invested in, for more than two decades. Looking at this, it is almost a no-brainer to presume that the search for marketing technology on Google will increase over the next 10 years. Ultimately we believe that adtech will be completely absorbed into the marketing technology environment. It is likely that it will become an integral part of any marketing stack or comprehensive marketing environment. What is your opinion on this topic? Let us know in the comments. Nothing is more difficult than to predict the future in this day and age. We live in times of disruptive changes, the sharing economy and an ever-increasing emphasis on social media. We do think that marketing will evolve with it and tools will follow. In fact it is probably fair to say that the changes in the marketing landscape will lead to an increased need for information and expertise about marketing technology that is relevant to these changes. In short we expect marketing technology to increase its upward trend as a search term. This is not the last you heard about it. Stay tuned!